It is not easy to get a good job. The application and interview process is a nightmare, and the chances of getting hired at any job are usually not very good. Higher education certainly helps qualify you for more job opportunities, but there is more to it than that. I find that it is often connections or who you know that are most valuable when it comes to getting a job. Often a parent of a young person looking for a job will help get them in the door at the company or place they work at. Other times, it might be a friend that tells you about an opening at their work and recommends to the supervisor that they hire you. If you don't have connections like these, or at least not in the career area you are pursuing, it can be very difficult to get hired. Another topic of discussion is salary or how much you get paid for a job. I find that there is a wide range of different salaries and they are not always equivalent to the difficulty of the work. Some very strenuous jobs pay very little while some other jobs that might be easier can pay a lot more. So you say, why would anyone pick the hard low paying job over the easier high paying job? The answer is because they don't have a choice. Many people are limited by things such as education, disabilities, and resources. They are forced to take lower paying jobs because of these limitations that are often beyond their control. Personality and appearance are also important qualities when it comes to being hired. 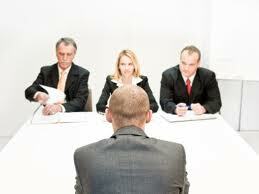 Usually when you interview for a job, the person interviewing you will be someone you work with on a daily basis. Because of this, the interviewer will hire someone they like. If 2 potential candidates have similar qualifications, it will come down to personality and who made a better impression. This can also be a limitation for people who may not have good social skills or struggle when talking with people in a stressful situation. Like personality, appearance often has an effect on the likelihood of getting hired. You can do your best to look good and dress well, but some things you just cannot change. Overall the job process is not fair, but as they say, life is not fair. All you can do is work hard and try your best to use your abilities to make the most out of what you have. 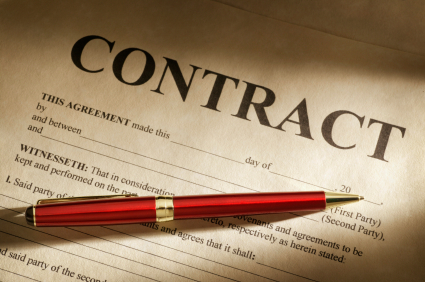 One thing that really annoys me is the language used by lawyers and the legal system when it comes to contracts, terms of service, and documents. You know the kind with all the big unnecessary words and run-on sentences. They might have you believe that it is for legal reasons so it can be interpreted by the law, but I disagree. I don't see why they can't write these contracts in normal everyday English. It's like a conspiracy put on by those on the legal business to try to keep their craft alive. They write up these contracts in "their language" so they can understand it, but everyday folks cannot, or won't try because it is too difficult to read. So then it forces us to hire a lawyer to look over it to make sure everything is ok before we sign it. This needs to change. Enough with the legal speak and technical jargon. Lawyers, who are you trying to impress with your big words that no one actually uses? Any contract can be translated to make sense in normal everyday English so why are we still supporting this ridiculous system? As a person who wears prescription glasses all the time, I had tried a few different solutions for solutions for sunglasses in the past. I started with clip-ons that were made for my frames which were ok, but somewhat heavy and unflattering. Then I got a pair of sunglasses and has prescription lenses put into them. This was ok, but it meant carrying around an extra pair of glasses everywhere. Next, I tried Transitions lenses that get dark outside when exposed to UV rays. Those were ok, but they didn't work in the car, and also when you go inside, it would take a while for them to go back to normal. So finally, I was without any eye protection and still wearing my regular glasses. I wanted some kind of sunglass solution, mainly for driving when there is a lot of reflection from the sun on the cars in front of you. I thought about getting prescription lenses put into my sunglasses again, but the cost would be over $100. Then I looked up clip-on option again. I found that Walgreens was selling a variety of these for $15. This is reasonable so I went to check them out. At Walgreens, I found the display of Solar Shield clip-ons. They had a lot of different styles and sizes. What's nice is the cases snap open so you can take them out to try on to see if they fit your frames. I tried a bunch of different sizes until I found one that fit the best. Of course it wasn't perfect, but for $15 you can't complain. They are adjustable by way of a spring in the middle that lets you stretch them out and let them retract. They are also available online at sites like Amazon. 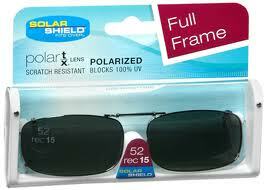 On the package it says they are polarized, scratch resistant, and block 100% of UV rays. I really wanted the polarized because that is suppose to block the glare. Once outsize I tried them out. They didn't really block the glare that much which was disappointing, but overall it did provide a shield from the sun. The build quality of the frames is ok, but they are not that strong. I would recommend being very careful with them. I could see them breaking if you sat on them or something. Since my clip-ons were a little big, I tried to modify them a bit. I got this clear adhesive rubber and attached little strips to the inside of the little hooks on the edges of the clip-ons. I secured them with some thread. Now they fit very well. The Solar Shields come with a clear plastic case that you can use. I opted to use an old flexible clip-on case that I had from a previous pair of glasses. Overall if you wear prescription glasses and are looking for an economical way to block the sun, I would recommend trying out Solar Shield clip-on sunglasses. Update 4-6-15 3 years later, I still have the Solar Shield Clip Ons and they are still working well. They are a little scratched up do to normal wear and tear but overall they are still good. I would buy another set if these ever wear out too much. 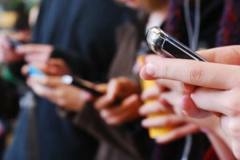 One of the biggest complaints people have about the internet is advertisements. They pop up and get in your way and clutter your screen making it harder to actually read or see the actual content. Many people just put up with this annoyance, but there is an easy way to stop ads on the internet. 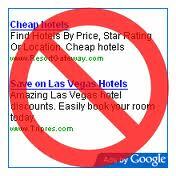 There are free applications you can use with your web browser that will block those intrusive ads from your screen. I use one in particular called Adblock Plus. It is an Add-On that is used with FireFox and Chrome. It is free and can be installed easily. Once you have Adblock installed it will block pretty much all of the advertisements you come across on the internet. Even most of those ads that play before videos will be blocked. The result ends up saving you a lot of time and annoyance with having to navigate around these ads. If you are tired of advertisements interfering with your web browsing, be sure to try out a free ad block program like Adblock Plus.